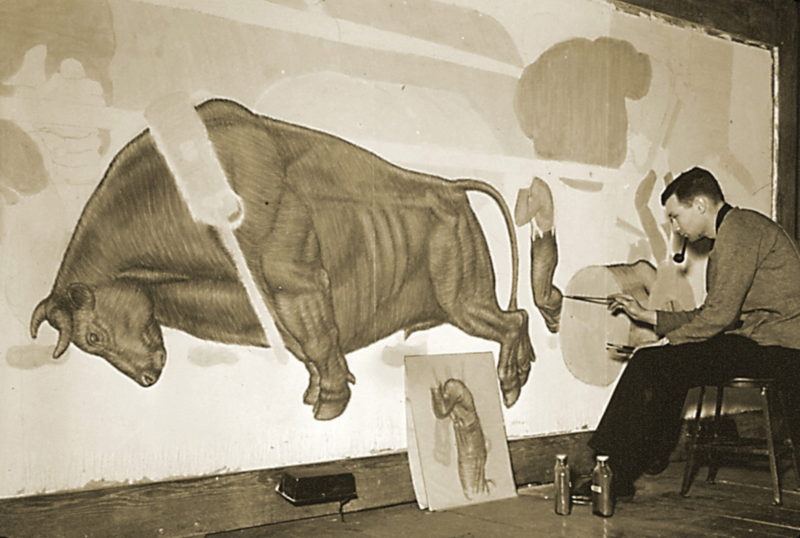 James Watrous paints the iconic Paul Bunyan mural for the Memorial Union. Photo courtesy of the Wisconsin Union. From Frank Lloyd Wright to Melvin Gordon III, Badgers have always been set on making history, and on June 19 we did it once again! Memorial Union has officially been recognized in the National Register of Historic Places according to the National Park Service. According to UW-Madison Historic & Cultural Resources Manager Daniel Einstein, the most important aspect of Memorial Union that qualified it for national recognition was the visionary work of Porter Butts-the Union’s first director. Nicknamed “Mr. Union,” Butts was a tireless proponent of the idea that colleges should educate a student in a variety of social, physical and creative activities outside of a classroom setting. Butts became the Union’s first director in 1926, two years before Memorial Union opened its doors to the public. He remained director for over 40 years and retired in 1968. The history of Memorial Union does not end with Porter Butts’ influence in the national college union movement. From memorials for UW-Madison students who died fighting in both world wars to the Paul Bunyan murals commissioned as part of the New Deal, the history of Memorial Union is deeply intertwined with the history of Wisconsin and America as a whole. The future’s looking bright as Memorial Union Reinvestment enters its final phases, with loading dock construction, Terrace renovations and east and central core renovations. Maintaining its historical charm, the renovations will modernize the building allowing easier accessibility for generations to come. Congratulations, Memorial Union, you deserve it! What is your favorite piece of Memorial Union history? Share in the comments section below! Jake Witz is a UW-Madison sophomore double majoring in English and Computer Science. You can catch him watching his favorite bands perform at the Rath or if you squint really hard you can spot him kayaking on Lake Mendota.